I’ve discussed semicolons before, and I’ve linked to helpful and entertaining explanations elsewhere, but for a variety of reasons I thought it would be worthwhile to recover the basics of the semicolon. It helps to think of the period as the strongest punctuation mark because it signals a full stop at the end of a complete thought. Commas are the weakest. They just ask you meekly to pause. People push commas around. Sometimes we just ignore them, moving right along without pausing at all. I mean, what’s a scrawny little comma going to do about it anyway? Periods, on the other hand, you’d better listen to. Notice that a semicolon looks like a period sitting on top of a comma. It also functions like a cross between them. Like the period, it can signal the end of a complete thought, but like the comma, it doesn’t signal the end of a sentence. My fish tank is full of clown fish; Stanley’s is full of goldfish. I’ve never liked roller coasters; they make my stomach flip. There is a list of transition words called conjunctive adverbs that always need a semicolon when used to connect independent clauses. These are great words to become familiar with as they help show how one sentence is related to another. Here are some of the more common conjunctive adverbs (some of them are compound —made up of more than one word). The sheriff tried to cut the ropes that held him; meanwhile, the Glanton Gang took the opportunity to steal some more horses. I’ve been to France several times; however, I’ve never visited the Louvre. I’ve visited Meridian, Mississippi; Eugene, Oregon; and Canton, Ohio. The team was led by Gene Stanley, head coach; Larry Stepford, line coach; Earle Blackfoot, defensive coach; and Tommy Voorhees, special teams coach. 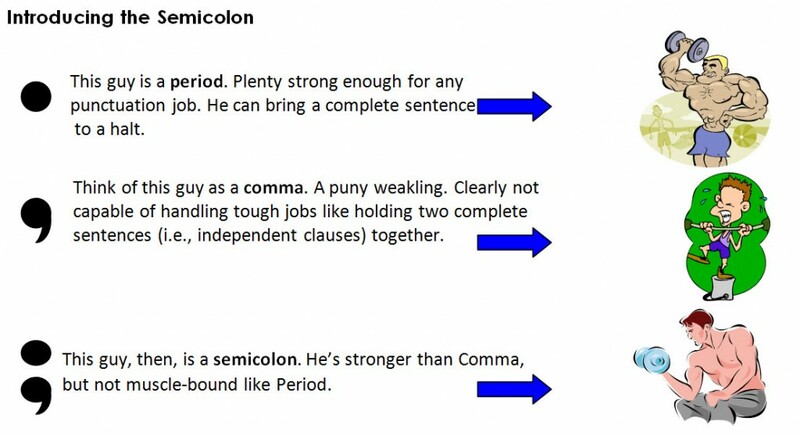 If you are not presently comfortable using semicolons, just learn the two uses above — to join independent clauses and to connect parts of a complex series — and start working them into your writing. 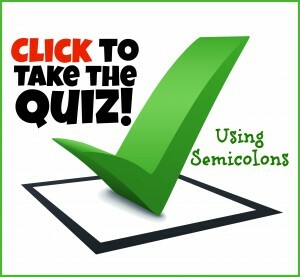 Care to test your semicolon skills? Try this free 10-question quiz. 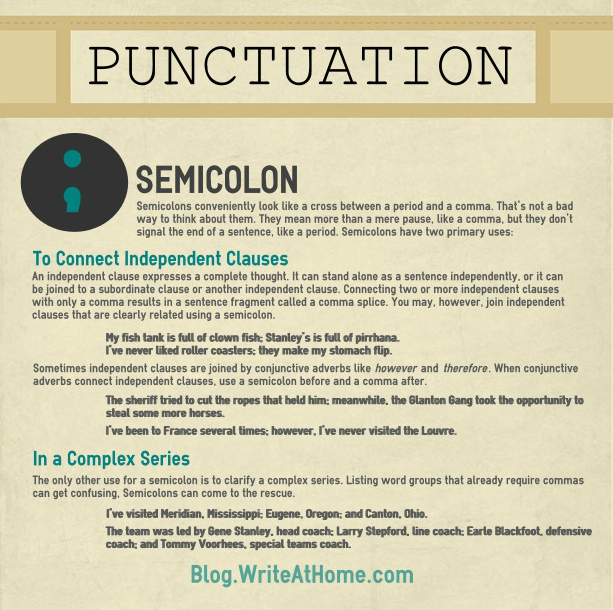 Here’s a pinnable poster that summarizes semicolon rules. You can find others in our Free Resource Library. As always, I’d love to hear your thoughts. Use the Reply section below. Brian, I think I forgot to tell you that I scored 100 on your quiz! Also, it’s not technology per se, but our sometimes unhealthy reliance on it rather than on brain power. The grammar and spell check programs often give inaccurate suggestions, and if one does not know proper usage, many errors can occur. Thanks so much for your quiz. I did not find it difficult; however, I understand that some may. As always, it is a great reminder to get back to the basics; however, modern technology has wreaked havoc with proper communications. Glad you like it, Angie, but I am less critical of modern technology. I think it is merely changing what is considered proper communications.